afternoon. If you thought you’d already read the famous “Dhammacakkapavattana” sutta before, think again. Rendering dukkha with “pain and distress” seems an acceptable choice. The pāli word dukkha is used for physical sensations of pain as well as for the opposite of sukha (happiness => ergo unhappiness). Thus dukkha covers the realm between the pain in the body and the pain in the mind, i.e. “pain and distress”. I also like pathfinder… it has something of the special flair the word “Tathāgata” creates in Pāli. You crave sensual pleasures. You crave for pleasure to go on forever. You crave for discomfort to end right now. In fact, every sensation, every perception, every emotion you feel, every belief you maintain, every thought that arises in you – hanging on to all that just produces more pain and distress. while incredibly readable – simply just scratches the surface of the what the Buddha alluded to. Bhavataṇhā and vibhavataṇhā really do mean what they mean: a thirsting for existence (or to be) and for some people even a thirsting to not exist exists ( 🙂 ) – it all is just thirst. Kāmataṇhā, bhavataṇhā and vibhavataṇhā can therefore be easily seen as an ever refining way of clinging or thirsting. So even if you overcame your craving for sensual pleasures tomorrow (kāmataṇhā) you are still NOT done. Then again, even if you overcome your thirst to be (bhavataṇhā) your are STILL not done. Even if, in the meditation battles of the Anagami, he finds himself longing for the non being – he still is trapped by longing (vibhavataṇhā) – see that? According to the Buddha viññāṇa does not merely occur with thoughts. It occurs with any of the six senses. This is subtler and important at the same time! The most straightforward and non-technical rendering could be “recognition”(2) (consciousness is more or less a meaningless term when all five groups of grasping are supposed to be seen in your meditation and not some empty names on a philosophical list. Can you be aware of the impermanence of your consciousness? Hardly. But could you become aware of the fact that your mind recognizes things. Sure!). Therefore, this of course is a trap: Our thirst and craving is NOT just targeting the object (thought) itself which we experience, but we also thirst the experiencing of the experience. Gotcha! That’s why waking up from the 6-D cinema (see last post) is so subtle a matter. (1) Helpful in this regard is a reading in the Khandha- and Nidāna parts of the Saṃyutta Nikāya. Highly recommended. Thanks for the pointer to this translation, it is very interesting. Having discovered the rules about compounds with -gata I find it puzzling that Buddhists could have got into such a mess with this word. This is not trivial because it is the main way that the Buddha referred to himself! I like Gair and Karunartillake’s example (p.25). avijjā + gata does not mean “gone to ignorance” it means “ignorant”, i.e. *in the state* of ignorance. The translation “thus-gone” is treating tathāgata like a karmadharya which would be more literally translated as “thusly-gone” or in better English “gone thus”. It has never made sense to me for the Buddha to refer to himself thusly. I think we need to treat tathāgata as a tatpuruṣa which means something like “in that state”, or “like that”. That is to say he is Awakened. Pathfinder is certainly not an inaccurate description of the Buddha, but it is a terrible translation of Tathāgata. Still no-one seems to have taken in K.R. Norman’s discussion of the word ariyasacca – which is also probably a tatpuruṣa – truth of the nobles. If you start from scratch then “noble-truth” is quite an unlikely translation of such a compound! Let alone essential truth, though again it is essential that we find the truth of the nobles. Tathā conveys such a subtle meaning, it might almost be left alone and explained in a footnote. What does a modern reader do with Thus-gone or Thus-attained (if you take it as āgata) or even “Having thusness”. Clearly the Buddha preferred to use it, as it describes the state of an arahant like himself best. “Pathfinder” solves this problem by replacing it with something new 🙂 like Karl Eugen Neumann did in German using “Vollendeter”. Thank you for this. In addition to reading Ajahn Brahmavamso’s “Mindfulness, Bliss and Beyond”, adding the Dharma Study group to my arsenal of resources can only improve things! You’re easily impressed, aren’t you? Not that i’m saying that the earlier translations are all well and good. This translation is trying hard to be folksy and approachable? Is that truly helpful, though? To me, all suttā are meditation manuals and they are not meant to be read casually by anyone. Encountering familiar English terms — like consciousness and contact — or creatively substituted terms may mislead one to thinking that one understands something, but it is primarily a delusion! There is a threshold of proper understanding that one must learn to cross before one can approach any Pāli text confidently. But the key questions i always ask people is: Why do you want to read the texts? Why do you approach Dhamma at all? For intellectual accumulation and acquisition? Please, stop now. Anyway, technical terms… Does dukkha really mean “pain and distress”? When one is smilingly enjoying a sweet, juicy tangerine, dukkha is right there! Hey, let’s face it. Dukkha is to be understood (not sugar-coated by any cute term or phrase). Its origin is to be abandoned. Its cessation is to be realized. And the path leading to such cessation is to be cultivated. It’s all about practice, in the present-moment experience, right here, right now. Those are the four goals to be fulfilled if you wish to be liberated (and liberation could happen any time now), and i don’t really care if you call it “truth of the nobles” or “noble truth” or “enobling truth”. So, do you want to make the commitment to proceed? Other than that, spare me the modernized translations and the fancy words, will you? Amen! In a reply to another post (long, long time ago), i already touched upon the significance of the Noble Eightfold Path vis-à-vis the present-moment experience in Vipassanā practice. In that light, would you consider the factors of the Path signify moral guidelines for laypeople? Like, “Make sure you have the right job. Don’t go sell guns and butcher cows, okay?” Would you think this is what is meant by Right Livelihood in the context of practice vis-à-vis the present-moment experience? There is no superfluous Teaching. Every piece of Dhamma is relevant — in terms of practice for Liberation. Again, spare me the cute translations that do not bring out any fresh and relevant instructions for practice? Want to feel nice? Go entertain yourself one way or another. Here, we practice only — and i mean properly. Yes agreed. I do share the same opinion, that the Buddha made them (the listeners) practice right at that moment WHILE he was talking. This would explain a lot. And in fact, most suttas work as meditation object, see my frequent references to “iti”. If i’m hard pressed to find a “better” (forgive me!) rendition for viññāna, i would suggest “cognition”, but not “recognition” as the author recommends. “Recognition” is a function of saññā, and is closely related to “perception”. For example, from a visual cognition of colours and shapes, “the neighbour’s cat” is recognized. In any event, familiar English terms tend to engender a sense of complacency, whereas practice is active, relentless, wordless investigation of the experiences as they arise and pass away. The key is understand what the Buddha (or the suttā, for that matter) said about certain objects and instructions. For example, a French-speaking professor friend objected to the term “impermanence” (for anicca), arguing that it is not a French word (“bizarrerie,” he lamented) — and he’s right. At the same time, he nodded, in apparent appreciation, when i mentioned “esprit” or “mental” (for citta), for example. I’m sure he understood none of those terms, and has no way of truly understanding them because he doesn’t practice, yet he speculated — like most people. Now, with regard to viññāna, there is one very important thing to note…and that is the prefix “vi”. If you remember viññāna in the Samyutta is at one point explained by the Buddha to be the ability to distinguish different flavors: ” this is sour, this is sweet” etc. So while saññā is that part of our experience in each moment which consolidates, it is viññāna which discriminates/distinguishes/recognizes – and we are not talking about a train of thoughts here, because, each such moments of thought itself already makes viññāna arise (as you know). So yes, I am torn between cognition and re-cognition as a translation. I am a 100% sure that the farmer listening to the Buddha or the cowherd would have had no clue about “consciousness” and how to see that as impermanent – even today that term consciousness is so empty or too broad in its application. But if you look at the simple way viññāna was used in “every day” language by the Buddha, namely whenever he would say: “See over there the forms (re-)cognizable by the eye” he would use this expression in pāli: “cakkhu-viññāneyyā rūpā”. So it occured to me that if you are forced to translate that particular expression into English – whatever rendering you come up – it would definitely be better understood than the abstract consciousness…and even more important so, it would immediately make sense that you cannot attach any view of self onto that “(re-)cognition” itself – which, IMHO is the largest single brake for most vipassanā systems. Now, let me ask this: Are terms “citta”, “mano” and “viññāna” truly equivalent and may be used interchangeably? I say no, they are closely related, but they are not equivalent and they should not be used interchangeably. No amount of cutesy, folksy and creative translations can bring out such instructional distinction! Have you ever given meditation instructions? Or for that matter, lets say you are an expert in some area and someone asks you to explain it. Are you sure you would always use the exact same term for that thing? You won’t – depending on the level of detail, depending on the ability of your listener and circumstance you would pick the most appropriate word your language would provide you for that particular application. And your biggest goal in mind would be that the listener would understand what you try to say. Nothing else is true in this case. So, whenever he spoke in a more general sense about “the mind” he would use citta. This is actually how most people in the West would talk about “the mind” – in pali that would be citta. When the Buddha got more technical he spoke of mano – dhamma (mind as a sense sphere and mind objects) – So mano is used on the level of talking about the six senses. We do not use a different word in this case, we simply say “mind” and thoughts here too, unfortunately this can lead to a confusion as some people might think we speak in general terms but in reality we try to describe a meditative insight of how the senses operate. Now, even one level more technical and we get to viññāna. Viññāṇa was a term the Buddha used when contrasting it to name-and-form. Each of the five groups of grasping occur in every moment our six senses experience something. So what we generally speaking call “mind” is in reality (that is through the vision of vipassana) the experience of each moment == a knowing of names and forms. every moment. But this is as far as the Buddha found concepts helpful enough to do the job. He never went into more papanca beyond this point (like we see in the Abhidhamma) because its irrelevant to the path of Nibbana. Have you ever given meditation instructions? The point i was trying to make (desperately?) is that Dhamma terms are precise and specific, and one must try to understand them properly so that they can be used appropriately. To make someone understand something is not a matter of making that thing overly simplistic. Simplistic != Simple. Cute != Readable. The Dhamma terms are not there for people randomly use as they please. Each of the term has its specific meaning and precise function — again, for practice onḷy, not for idle discussion nor for intellectual speculation. Translation is not easy. And critiques are extremely important. (Recall the wonderfully deep advice of the Buddha about “having friends”.) I also say this to my friends who are literal types, translating essays and novels. One must immerse in the subject and gain a solid understanding before one can translate meaningfully. The Venerable Bhikkhu Bodhi still revises his translations — good for him! theravadin: Better note before excitement (nandi) even arises :-). I am sure when you give meditation instructions you are not using language like a robot. Neither did the Buddha. Guiding someone in understanding is not just about mere technical vocabulary. It is making people understand – on whatever level they are. I do share your worry that the Dhamma should not be watered down. At the same time there are tons of translations which make no sense because the person translating it never practiced what he tried to translate – it might sound very technical but might completely miss the point. So surely I get excited finding inspiration from others. Question is: do I see my excitement arising? Dear Khandy, mettā to you too! When the Buddha spoke to people at his time – even when he would talk about subtle things – he used language and metaphors in a very skilled way. No, I do not think that you had to have a diploma in Abhidhamma nor advanced psychology in order to understand the Buddha. Even un-educated farmers, cowherds and young children understood his message. On the other hand, and I think this blog is so far a good example of that conviction, the Buddha did not sugar-coat samsara in order to be more appealing to the mainstream of society. When you read a pali text – in pali – and are able to immerse yourself in it, backed by your experience of the things discussed to whatever extent – then that text will never appear scholarly to you but rather direct, lively and very modern. 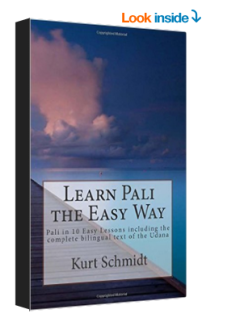 However, if you take pali in a pure scholarly way and on top of that, if you never had the chance to put his teachings into practice – almost out of necessity your translation will sound quite bumpy and artificial. You might not know what the Buddha meant nor why he said something and so you rather stick to an etymologically correct meaning which however was understood completely different at the time of the Buddha. It is funny, but in a certain way you agreed in your response that this translation is very readable. And that is all I am saying here. Even if this text is not precise on the information of the Dhamma in e v e r y regard it still conveys into English a little bit of the inspiring reality of the Buddhas message and how it must have been heard when they sat in front of the Buddha. Now another reality is that language is an instrument of communication. So it is not always the best idea to hang ones had on one or the other word which we find in the translations. Far more important – and I think you do agree on that – is to realize the essence of what the Buddha tried merely to convey through the inadequate means of papanca, thoughts and language. For a newcomer to the teaching of the Buddha a translation like this might make him want to look deeper – and so he will start to practice – which – paccattam – is the only way we can r e a l l y get to know the Buddhas teaching. Everything else is a raft, for better or for worse, and this raft does not always appear as the same to all people at all times. Well, being readable does not mean being helpful or useful, or even meaningful. This is the point i was trying to make — perhaps unsuccessfully. I never stated in my responses that “this translation is very readable” (as you tried to suggest). The Buddha never used difficult, abstract metaphysical terms, this is for sure, but His instructions were always precise and meant for serious practice, not for “casual reading”. You are always welcome to like any translation you wish. The question is always: Why? readable here means == “easier to understand”. Na tassa paññā ca sutañca vaḍḍhati, yo sāhaso hoti naro pamatto. I definitely stay away from “consciousness” as an adequate translation for “viññāna” — and, by doing so, simultaneously alienate myself from all branches of Western philosophy and psychology. (Of course, the term “cognition” itself also bring me uncomfortably too close to them!) This English term of “consciousness” has caused so much confusion (and pretense) amongst the Westerners who attempt to study and practice Dhamma. It is a huge distraction and a cause for complacency. I usually suggest a simpler rendition of “viññāna”, and that is “capture” or “the captured”. “Citta” is the capacity of sensing, or capturing, that is always arising and falling away. “Mano” is the act of sensing, or capturing, through one of the six sense-doors, in the present moment. “Viññāna” is what is captured (a particular capture) by the present-moment act of sensing. Immediately, this capture has a “shape” and is to be “felt”, “interpreted” and “reacted to (or acted upon)”. Together, they are the five clingable aspects of the present-moment experience. If the practice is lacking, “viññāna” conditions “nāma-rūpa” (causing the so-called vortex) and one continues to stumble in samsāra. If the practice is ultimately solid, “viññāna” ceases (to be a condition for “nāma-rūpa”). And we can always translate “cakkhu-viññāneyyā rūpā” as “the forms captured by the eye” quite nicely. BTW, citta, in the suttas, really simply just means “mind” in a very colloquial and non-technical use! Later, in the Abhidhamma days, they needed more and more terminology and filled citta with a lot of mechanistic ideas which you will not find in the way the Buddha used that word. If you happen to read a lot of Burmese vipassana material you might get a more complex idea about citta (Burmese Sangha loves the Abhidhamma) but mano and vinnyana actually “capture” everything we need to know from a pragmatic standpoint! Having said that, metta & good night to you! OK, let’s just say, “readable” means “easier to understand”. But translating “dukkha” as “pain and distress” does not bring any proper understanding, applicable to actual practice. My dear mother still maintains that i waste time with this pessimistic Buddhism thing. At 90, she is surprisingly robust and chirpy (bless her!) — no pain, no distress. But, watch out! Dukkha is always there but she doesn’t know it. So when the Buddha equated the 5 groups of grasping with pain, that is a very powerful thing to say! That’s why you are right, we should say something in a way so that people understand even if one has a hard time to fathom the implications of it right away. Back to “viññāna”… The prefix ‘vi’ means ‘various’ or ‘many’. Now, “viññāna” itself does not distinguish or discriminate. First, the manifold relates to the fact that there are six sense-doors, hence six kinds of viññāna. Thus, it describes a particular part of our momentary experience – which is equal to whatever sense experience (including the mind) we talk about. But I am just rephrasing your statement above. Vipassanā: Make sure you note your noting experience 🙂 Or capture your capturing as well! Well, “you” don’t willfully capture anything. The process of capturing (mano) happens, and there is the captured (viññāna), which could be seeing, hearing, thinking… depending on the sense-door at that moment. Now, if Vipassanā properly practiced, the mental factor of sati arises. In this case, “you” are instructed to mentally note “seeing”, or “hearing”, or “thinking”… No details, no conceptual proliferation. Here is the problem with quite a number of vipassana instructions IMHO: they focus on the object (sight, sound…thought) and that is alright, as most people start on that level. So when your awareness sharpens but because of your (too narrow) meditation instruction you artificially (by interrupting this process) turn “your” attention only to the objects itself noting them but forget/skip/ or make no effort to note EVERY detail of this process you will prevent seeing the rising and falling of viññāṇa too. Noting the five groups of grasping means noting every or any aspect of your experience – not just the content of your noting. But I guess we probably mean the same thing. I highly recommend it…basically at the very end you will see what I meant. To me, “citta” is simply “mind”, the sensing capability, that which makes sentient beings (“sensing machines”) sentient, that which causes the eye to function when there is contact with light. An eye of a dead person can still be fresh enough for surgical implantation into another person, but in the dead person there is no more “citta” (passing away without arising again) for that fresh eye to function. All the other Abhidhammic details that got attached to “citta” in later times are, at least to me, completely irrelevant. Yes, i have read it. It is quite useful. Thank you for having recommended a while ago. Yes, one should note any aspect of the present experience, but only as clearly intentioned, in the spirit of the Satipatthāna Sutta, or specifically the four mindfulness foundations of kāya, vedanā, citta and dhammā. After a while, some of the practitioners can distinguish between physical pain and unpleasant sensation and anger. There is no mix-up and no unskillful reaction due to the confusion. This is wonderful — dukkha is to be understood. My name is Sadhuvijay Kumaran.I am a Hindu and is new to this philosophical world.I have heard that the Buddha attained Nibbana,that is what we hindu call Moksha(enlightenment).According to hinduism,a person at enlightenment experience the unreal and illusionary nature of this world along with a deathless state of mind that is permanent.At that state we experience brahman which is nondual in nature,neither with form nor with qualities,ever lightful,true knowledge and of whose manifestation is the entire world is.According to buddhism at enlightenment sunyata is experienced.I want to ask is this ‘sunyata’ is the ultimate reality in buddhism? and whether ‘sunyata’ has the same charecteristics as ‘brahman’?I will be greatful if you can give more clear explanation of ‘sunyata’. Thanks for you comment. There is a short and a long answer to your question. As a long, but very profound answer, I would suggest the following series of talks to you which the venerable monk Bhikkhu Nyanananda gave: The Nibbana Sermons. They will provide everything you like to know on this topic (at least theotically) and also give you some very good idea how and why the Buddha’s teaching on Nibbana fundamentally differs from the Hindu perspective. One who has reached the end has no criterion 3 by which anyone would say that — for him it doesn’t exist. When all phenomena are done away with,4 all means of speaking are done away with as well. As you can see, Nibbana is no “thing” – neither as an object nor as a subject and therefore terms like “sunyata, brahman, god,..” do not apply. It is the same as if someone would ask you if the cessation of a flame “is”. But, what we do can describe is the process of cessation – and the personal experience of which the Buddha and his Arahants related in many discourses throughout the Tipitaka. Thank you for kind question for your kind guidance my previous query.But i have some confusion, i would be thankful if you could give me some insight into the matter. My first question is that are you a monk ? My second question is that what is the practicality of buddhism , i mean to say lord Buddha taught importance of dispassion in path to liberation, the doctrine of five aggregates (panca skanda), the dependent origination (Paticcasamudpada),the eightfold path.But these all are suited for monks rather than common household working people. Because to survive they have to work and to work there would be some attachachment contrary to deattachment. If everybody becomes monk then the world will stop. Every invention and discovery like medicine intended for well being of humanity is a result of scientist work if they stopped this all due to disppasion then many may die due to calamities like epidemic and diseases.Could you tell anything in buddhism that could be followed by us common working people? I am sure there must be something taught by The Great Lord Buddha for us like people after all he is the knower of everything ,the Blessed One. As a matter of fact I am currently not living a monastic but household life. And while it is true that his path leads to dispassion and ultimately allows us to step out of the cycle of rebirth, like every other path it starts with the first steps. Many of the Buddha’s lay disciples had attained to high degrees of awakening, and so that path can definitely be undertaken by any student of the Dhamma, no matter if he or she lives in the house or in the monastery. One day the Buddha was asked, that surely, the monk’s life is so much easier, but the Buddha replied, that though it has less worldly obligations it can still fail (in terms of making spiritual progress) and that while the lay persons have more to concern themselves with obligations towards society, they still can be very successful in spiritual insights as well. The way we beings wander through samsara will hardly allow a scenario where all people would want to become monks or nuns – very unrealistic. But consider this: To us Buddhists, the monks and nuns are like university professors of the Dhamma. They are supposed to work on the frontier of meditation and wisdom and their “scientific” insights into the nature of the mind they then share with the rest of us, who in many cases love to support their investigation into the profound aspects of the Dhamma. 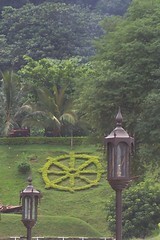 In such a way, they will keep the “path of the Buddha” clear and make it visible and well understood. Just like doctors and scientists help us in our material needs. But because the Dhamma of the Buddha is in essence entirely pragmatic: to practice the Buddha’s message is any Buddhist’s best way of showing our gratitude towards the Buddha. much metta, to you and I highly recommend reading the “Middle Length Sayings” of the Buddha (Majjhima Nikaya) they will clear away many questions about Buddhism. Thank you for your kind guidance. I would like to know from which country do you belong,i mean is it any theravadin country(Sri Lanka ,Burma ,Thailand ,Laos ,Cambodia)? Could you tell me what is the difference between the doctrine of anatman and sunyata.Both refers to the absence of inherent self in every thing.Or is it anatman is for individual concept and sunyata is for universal concept? and the “self” referred in the word ”not self”(anatman),is it the egoistic self or it refers to any other ?